Why is there a 900 foot long chopped off serpent head laying on the ground in the middle of Sri Lanka? How many people know exactly who the “serpent” is or that his fall and destruction by our LORD Jesus is written of in the stars of heaven, given as signs, seasons and appointed times to us today? Using the wonderful Christian scholar Dr. Bullinger’s Appendix 12 “The Stars Also” , let’s see if we can begin to separate the “myths” of mankind and discern GOD’S TRUTH from what is written. 🙂 May our Heavenly Father continue to Bless this study and give each of us discernment according to His will. Seeing RED Socialism Communism in all the nations? What does it mean for our future? Where does it lead? This video is my opinion on some of the things going on and where I see it leading us. God Bless and let us stay watchful of changing events and stay in prayer for discernment. AV 9-10th day, History shows us two great destruction’s happened in this month in Jerusalem which also destroyed the man-made temple also referred to as the House of God., The Holy Place, The Sanctuary. Is this timing important for Christian’s today to be aware of and learn from? Time will tell God Bless and let us stay Watchful. TEBETH The 10th Hebrew Month, Dec14/15 – Jan13/14 on Gregorian time. 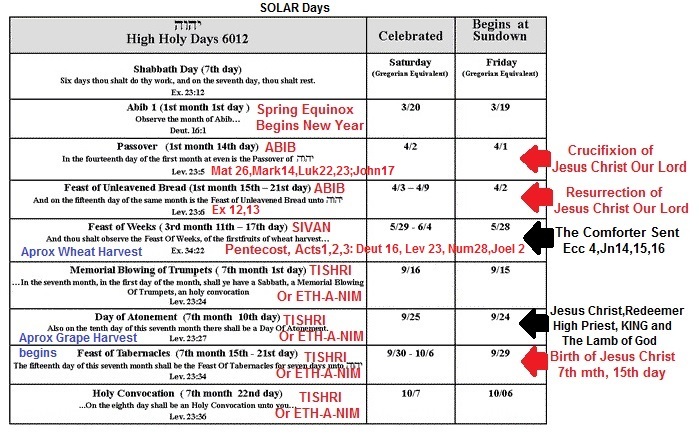 This is a continuance of our study of the Biblical months as found in the KJV Bible and aligning them with the Solar Degree chart to better discern the time we live in as changed to the Gregorian time. What does the word Tebeth mean? What does the number 10 mean or represent in the Bible? May our Heavenly Father bless each of us with eyes to see and ears to hear. TEBETH-The 10th Hebrew Month part 2 Dec14 – Jan13th, the priest courses. TEBETH The 10th Hebrew Month Part 3 Dec 14 – Jan 13, This study we use EW Bullingers Number in Scripture the number 10 to help better discern the meaning of the number 10 in our Father’s Word. This study we look at the Strongs Concordance to find the monthly events that were given to us in this 10th month as examples, Gen 8, Rev 17 to point out a few.